Yeah, the Darvin one. Poker Grump takes him to task over misremembering a hand. I read the same Shamus article he did. Now Grump goes off in genius mode and take the Moon man to task. You can wax poetic about any hand history. 95% of them produces pure posturing. I'll mention those two words we throw about – imperfect information. HH's don't work like that and there is no context. You’ll recall that when the flop came both he and Kopp had flopped diamond flushes, with Moon holding , and Kopp . The turn brought the , Moon checked, Kopp bet 2 million, Moon check-raised to 6 million, Kopp shoved, and Moon called. Kopp was drawing dead. The contrast is stunning. Kopp is thinking, oh, about 17 levels ahead of Moon. Moon isn't even correctly aware of what the cards on the board are, let alone getting inside Kopp's head. He's playing somewhere between that infamous Level Zero and Level 1. Yes, Davin did misremember the hand. Been there and done that. Others in the blogs often come back with a similar confession. It happens. The Grump goes on about levels of thinking and contrast it to his ring play. He does keep most of his writing within that sigma of perfection that he pursues. He places Moon one step below a blogger's tournament early action. I guess it could be a hand between Jordan and Waffles and you can pick which is which – I can't. The hand Billy had is awfully close to Grump's love of 24. Maybe that clouds his thought. People have pet hands. I've heard the same for Presto in a sadly inactive blog. The double-nickels man made equally strident claims for his favorite. But, he's sent me complete hand histories of session and if you believe him or Grump about what they play or when, they will pawn you. Look at the hand and make Darvin into Negreanu and Kopp into TonyG. Now evaluate the hand. Sexton would wax poetic about the Cadillac of Poker. And he'd make a hell of a case. Read would get thrown in repeatedly – Moon had a read and the guts to follow it. He also had the second nut on the flop and the 4th on the river with action indicating that improvement was possible but the betting made it more unlikely than the board's pairing the turn. My view is that was a hand that might have played that way between the pros I mention. It would have been a somewhat reluctant Negreanu but I think he'd have made the same action. It is somewhat more possible he'd have folded but he's also a gamer. The story is his as much as it is for a Tony or other action player. He talks about small pot poker but his also capable of laying down prospecting hands that hit to a degree. Kopp ignored all warning signs in swinging his big stick. He put his massive stack on the line with the 13th or so nut and Grump thinks he's the thinker. If that is thinking, those in the home I'm someday headed for are bloody geniuses. Kopp is everything Negreanu screams against with his small pot outlook. And sooner or later people look those players up. If they don't, then they do qualify as Arnold's girly boys. Let's leave luck out of this conversation. Every one of the nine was lucky to get to the final table. One even demonstrated the chip and a chair success as others have in the past. If you look at the hand history above you looking at a molecule in the cosmos. Maybe Grump can recreate the big bang from that but I can't. 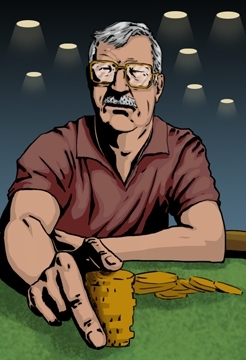 There is one unavoidable factoid: Kopp went all in drawing dead. You can assign one of Grump's many levels to that but that's more bar talk than than expanding mankind's knowledge. Nice post. I see you're playing around with different type fonts. Hard to say which I like best as they each have their advantages.